[or, entrails of earth, or earth’s intestine, or earth’s guts: earthworm. Often seen out of context as “Earthworms are the intestines of the soil.”]. Contrary to the widespread quote, Webmaster has not yet found a complete sentence in the original Greek translating as “Earthworms are the intestines of the soil.” Webmaster believes Aristotle did not write such a sentence. As far as Webmaster can figure out, Aristotle had no other word for an earthworm than the descriptive two-word phrase above. The word γῆς translates directly as “earth” and ἔντερα as “intestine.” In the context, Aristotle wrote only this, without any other wording for “earthworm,” in De Generatione Animalium (On the Generation of Animals), Book III, 10, 762b. Identified in Arthur Platt, De Generatione Animalium (1910), unpaginated page 23, end of 762b, footnote 1. The Greek phrase is given in William Keith and Chambers Guthrie, A History of Greek Philosophy: Aristotle, an Encounter (1981), Vol. 4, 290, footnote 3. The context, from the Platt translation is: “For all of these [animals], though they have but little blood by nature, are nevertheless sanguinea, and have a heart with blood in it as the origin of the parts; and the so-called ‘entrails of earth’, in which comes into being the body of the eel, have the nature of a scolex.” The translator footnotes that: “These ‘entrails of earth’ are earthworms almost certainly. A. thinks they are spontaneously generated, and develop into eels.” An alternate interpretation is given by A.L. Peck in Generation of Animals, With an English Translation (1943), 361. “The ‘earth’s-guts’ as they are called have the nature of a larva; the body of the eels forms within them.” Peck footnotes: “The ‘earth’s-guts’ are apparently the round-worm Gordius. Webmaster note: These are hairlike, very long, and very thin, nematoid worms that are parasites—not earthworms. Webmaster concludes that gardeners saying “Earthworms are the intestines of the soil” are quoting something that Aristotle did not say, per se, and he did not specifically talk about earthworms as gardeners’ friends conditioning the soil. 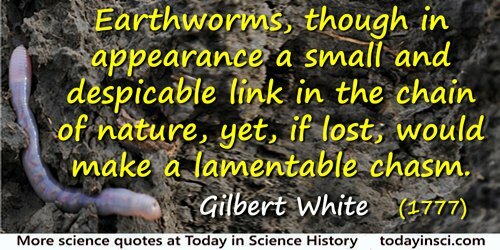 Earthworms, though in appearance a small and despicable link in the chain of nature, yet, if lost, would make a lamentable chasm … worms seem to be the great promoters of vegetation, which would proceed but lamely without them. Letter XXXV, to Daines Barrington, (20 May 1777) in The Natural History of Selborne (1789), 216 and (1899), 174. Every bird which flies has the thread of the infinite in its claw. Germination includes the hatching of a meteor and the tap of a swallow's bill breaking the egg, and it leads forward the birth of an earth-worm and the advent of Socrates. Here are a few things to keep in mind the next time ants show up in the potato salad. The 8,800 known species of the family Formicidae make up from 10% to 15% of the world's animal biomass, the total weight of all fauna. They are the most dominant social insect in the world, found almost everywhere except in the polar regions. Ants turn more soil than earthworms; they prune, weed and police most of the earth's carrion. Among the most gregarious of creatures, they are equipped with a sophisticated chemical communications system. To appreciate the strength and speed of this pesky invertebrate, consider that a leaf cutter the size of a man could run repeated four-minute miles while carrying 750 lbs. of potato salad. From book review, 'Nature: Splendor in The Grass', Time (3 Sep 1990). [My dream dinner guest is] Charles Darwin. It’s an obvious answer, but it’s the truth. Think of any problem and before you start theorising, just check up whether Charles Darwin mentioned it in one of those green books sitting on your shelf. Whether it’s earthworms, human gestures or the origin of species, the observations that man made are unbelievable. He touched on so many subjects. Then, Alexander von Humboldt, the last polymath. There was no aspect of the natural world that he wasn’t curious about or didn’t write about in Kosmos, an extraordinary book. From interview with Alice Roberts, 'Attenborough: My Life on Earth', The Biologist (Aug 2015), 62, No. 4, 16.